Vamos ficar na suíte Retreat Winery Rural. É um 1500 pés quadrados suite totalmente mobilada, no segundo andar acima da sala de degustação Rural Retreat Winery, onde você pode olhar sobre a histórica estação de trem e desfrutar da pitoresca cidade de Retiro Rural. A cidade, uma vez conhecido como o repolho Capital do mundo havia toneladas de repolho trazidos de vizinhos terras de fazenda e carregado sobre os comboios a vapor. O. Winston link fez o depósito famoso em seus 1957 fotos véspera de Natal e gravação. A combinação de fotografia e de gravação é mais incomum para esse período de tempo foi um grande despedida para o serviço de trem de passageiros na região. A cidade também foi a casa do Dr. Charles pimenta eo refrigerante como diz a lenda, é uma de suas misturas feitas na farmácia local para fazer você se sentir melhor. A cidade tem certamente algumas histórias para contar, venha se juntar a nós e fazer algumas lembranças para si mesmo. Fique conosco, desfrutar do centro da cidade com um bom copo de vinho Retreat Rural, abrandar um pouco, e relaxar! My son chose this apartment to stay for his birthday. He loved being close to the trains. The apartment was clean and furnished with everything you need. The staff were wonderful. We received excellent customer service. And I really enjoyed the wines. We plan on visiting again. Thank you for your visit and kind words. We look forward to seeing you again soon. It was perfect for our needs. Thank you. Thank you so much for staying with us. Look forward to seeing you again. This was a great place to explore the area. We were there for a football weekend, and the kitchen was large enough to prepare our food for the tailgating weekend. Very comfortable beds and the winery store is right downstairs. We enjoyed the wine tasting!! For a stress free weekend, this is the place! I highly recommend this place and if we're in the area we will be returning! Thanks again Linda!! Great place to stay in Rural Retreat! We checked for a VRBO in Rural Retreat, VA, on a whim, because we had an event to attend nearby, and were pleasantly surprised with what we found! The space was large and comfortable and easily accommodated four of us; the listing says it sleeps six (1 room with double bed, 1 room with king-size bed, 1 sleeper sofa in living room). Linda was very sweet and helpful and really made us feel at home. There is only one bathroom, so that is a minus, but there was plenty of hot water and good pressure in the shower. Linens (sheets & towels) are provided, but if you are allergic to perfumes, you might want to bring your own sheets. The bed mattresses are adequate. The best part was that being there gave us a space to just hang out together. And we went downstairs to the wine tasting room and sampled some of the local vineyard's wines - that was fun! I stayed at Rural Retreat Winery the last weekend of September. It was beautiful, warm but the leaves were starting their fall colors. There is so much beautiful country to see there. 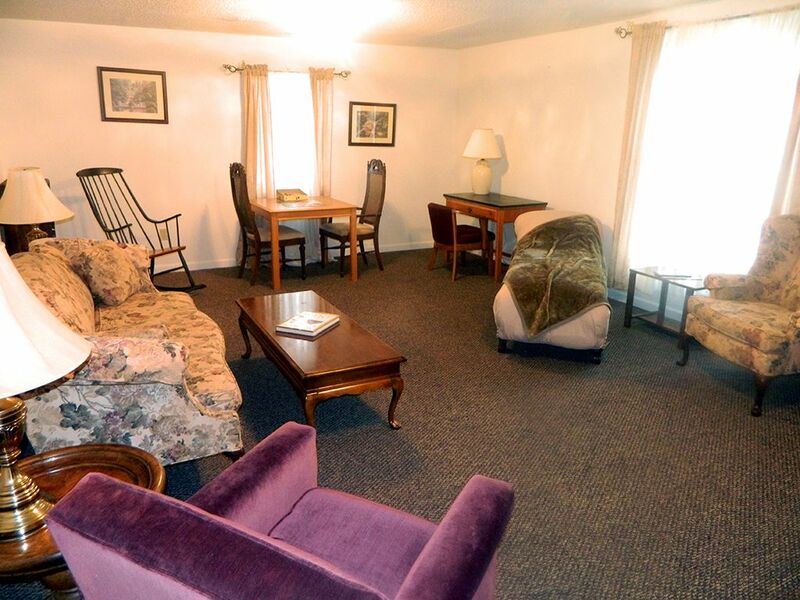 The condo was huge, large living room, bedrooms, kitchen and bath all complete with anything you would need. There is a grocery store at the top of the hill. But I took the weekend off, didn’t even have to cook. The winery diner downstairs had great homemade food in the deli. There is a large party room too. We are planning a family dinner party there. They also have lots of home made crafts or wines for your taste buds. Linda and Scott, the owners are such nice people. They are glad to help with anything you may need, as they live minutes away. I can’t wait until I can make a return visit to Rural Retreat. A happy visitor, from NC. While visiting family this past week in Rural Retreat I had the opportunity to stay in this apartment with my daughter and grandkids. All of the rooms are very large. The kitchen is spacious and wonderful. It has everything you need to cook a great meal. However; you don't have to worry about cooking for yourself because right below at the winery they serve delicious home cooked meals. The living room has plenty of seating and also has a table setup with a jigsaw puzzle already started and a whole bookshelf full of books. There is also a laundry room with a full size washer and dryer. All detergents and cleaning supplies are provided. I love to travel and have stayed in a lot of hotels where everyone is crammed in one little room and stepping on each other so it was wonderful to have all this space. I will definitely be back and highly recommend it. It was a pleasure having you in Rural Retreat. We look forward to seeing you again and appreciate your kind words. Esta suite está acima da sala de degustação Retreat Winery Rural e mais parece a pequena cidade histórica do Retiro Rural. Uma vez que a casa de Dr. Pimenta e do repolho Capital do mundo; agora é um pequeno obter um caminho comunidade.